We’d love your help. Let us know what’s wrong with this preview of Sudden Rescue by Jon Mollison. An empire of genocidal artificial intelligences threatens to overwhelm humanity, held back only by the combined fleets of humanity's lone superpower, the Majesterium. The allied might of the dozens of human systems who owe fealty to the Star King have long stood as a unified bulwark against the Syntharchy...until now. The alliance threatens to unravel when a planned weddin An empire of genocidal artificial intelligences threatens to overwhelm humanity, held back only by the combined fleets of humanity's lone superpower, the Majesterium. The allied might of the dozens of human systems who owe fealty to the Star King have long stood as a unified bulwark against the Syntharchy...until now. The alliance threatens to unravel when a planned wedding is interrupted by the sudden disappearance of the betrothed princess. To ask other readers questions about Sudden Rescue, please sign up. This book was highly enjoyable, sweet, and genuinely fun. I wasn’t sure what to expect when I picked it up, but I’m glad I gave it a try. The characters are genuine sweethearts, flawed but kind and loving. They stayed consistent throughout even as they grew, and they felt like real people. I found myself rooting them on as the story progressed. The world-building is fantastic. This author doesn’t use any generic sci-fi settings: every planet or station they fly to is really weird and cool. I wish This book was highly enjoyable, sweet, and genuinely fun. I wasn’t sure what to expect when I picked it up, but I’m glad I gave it a try. The world-building is fantastic. This author doesn’t use any generic sci-fi settings: every planet or station they fly to is really weird and cool. I wish he was designing settings for Hollywood and television, because we wouldn’t have so many bland worlds. Some really unique ideas in this story. A major point knocked off a star: A large number of frequent typos. This book needed some serious proofreading. It got distracting after a while. My hope is the author does another proofread and updates the kindle version just as a quality of life thing for his future readers. EDIT: The author has updated the novel and removed this issue, so the overall score was increased. Great customer service. Ah, the trials and adventures of E.Z. Sudden, master and sole crewmember of a tramp starship, Jade Rose. In a galaxy with a human civilization held together by nobles and royals, threatened by an AI civilization of genocidal intent -- he has problems of his own. He barely escapes a pirate, has to do some tedious tugging to get the full price for his cargo (he had sacrificed part to save the rest), and manages, in a lucky stroke, to salvage some items from wreckage. Boxes that need specialized ski Ah, the trials and adventures of E.Z. Sudden, master and sole crewmember of a tramp starship, Jade Rose. In a galaxy with a human civilization held together by nobles and royals, threatened by an AI civilization of genocidal intent -- he has problems of his own. He barely escapes a pirate, has to do some tedious tugging to get the full price for his cargo (he had sacrificed part to save the rest), and manages, in a lucky stroke, to salvage some items from wreckage. Boxes that need specialized skills to open. When he gets them open, he discovers that his adventures have, really, just begun. 'cause if he doesn't care about politics, well, politics care about what he found. Involves a fractal space station, a man who can't decide whether he hates or loves his life as a miner, killing artificial gravity, a bar brawl, and more. Sudden Rescue, released just under a year ago, starts with an archetype we're all very familiar with, the independent space hauler who's not afraid to shade the finer points of smuggling law. Captain E. Z. Sudden would be right at home with the likes of Han Solo and Malcolm Reynolds, dodging space pirates and overbearing AI empires until he is suddenly thrust into galactic politics with the recovery of some lost cargo containers, one of which contains a member of the local space nobility named K Sudden Rescue, released just under a year ago, starts with an archetype we're all very familiar with, the independent space hauler who's not afraid to shade the finer points of smuggling law. Captain E. Z. Sudden would be right at home with the likes of Han Solo and Malcolm Reynolds, dodging space pirates and overbearing AI empires until he is suddenly thrust into galactic politics with the recovery of some lost cargo containers, one of which contains a member of the local space nobility named Karenina. When it is revealed that she was on her way to a wedding that could make or break the human alliance against the aforementioned AI, she and Sudden must embark on a journey through treacherous peril and exotic, imaginative locations to stop a terrible war. 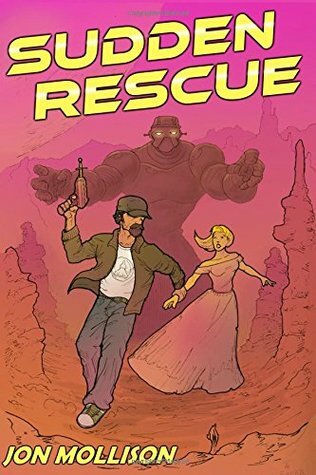 In addition, of course, to being a fun, adventure-filled work that rests on sound Christian principles without being preachy, the heroes are all heroic, in every sense of the world, and their sense of optimism makes a fine alternative to the too often nihilistic spirit present in many SF works today.